Editor's Note: We're pleased that respected survey consultant Thomas Miller has revised and updated his earlier Planning Commissioners Journal article. We're posting Miller's article in four parts today through Thursday. No planning department worth its salt creates or significantly alters a master plan, design guidelines, or zoning without input from the community. Numerous opportunities for input are often provided: forums held in every neighborhood; well-publicized community-wide meetings; call-in radio or cable shows; newspaper clip-outs. In many communities, however, it is not uncommon to find the same relatively small group of people attending each of the forums, traveling from place to place like a progressive dinner feeding on the soup of local politics. A town meeting about a re-zoning that finds 100 in attendance out of 100,000 in the community nevertheless makes everyone feel terrific because there was such enthusiasm shown by participants or the vision of residents was clearly expressed in fifteen breakout groups or a wide cross-section of our community came to listen and speak. Despite the public back patting for having done so well in the citizen input arena, many elected officials and board members are nagged by self-doubt about the real success of their citizen involvement efforts. Although they have cast their net widely, providing genuine and sincere opportunities for citizen participation, they know that the citizens who are most often snagged into participating are those with the greatest passion, the most time, the least reserve, and the most at stake. They wonder if the viewpoints of families with children; wage-earners steeped in the daily pressures of making ends meet; and sick or handicapped residents were adequately considered. A growing number of communities are augmenting traditional meetings and forums with citizen surveys. Surveys are far more successful in capturing the typical community resident and making that resident’s opinion part of the community calculus. A scientifically conducted survey of residents brings in the voice of the public like no forum, newspaper straw poll, or focused discussion. 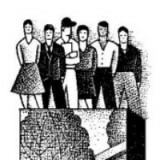 Whether conducted by phone or mail, a good citizen survey will provide the perspective of residents who are not the “usual suspects.” Our research demonstrates that 80 to 85 percent of survey respondents report not having attended any community meeting or watched a council meeting on television in the prior twelve months. Citizen surveys can be simple one-shot assessments of resident policy preferences. More valuable, however, is a citizen survey program -- with periodic public surveys designed to track changing community demographics; evaluate quality of life and quality of community services; and measure the extent to which various community facilities and programs are being used. From surveys conducted by the International City/ County Management Association, we estimated that the number of jurisdictions with over 25,000 population conducting broad citizen surveys increased from 3 in 100 more than two decades ago to about 3 in 10 now. 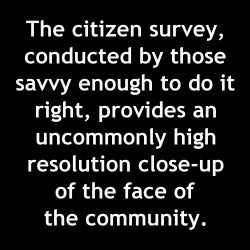 The citizen survey, conducted by those savvy enough to do it right, provides elected officials and planning board members an uncommonly high resolution close-up of the face of the community. Many different types of surveys can be used to assist in community planning. From general to specific, surveys can address topics such as quality of life; attitudes toward growth; transportation habits; park and recreation preferences; and economic development. In support of comprehensive plan updates, citizen surveys often include a set of general questions about the quality of life in the community and in neighborhoods. Questions may deal with residents’ perceptions about the community as a place to raise children or as a place to retire, and opportunities for shopping, dining, volunteering, adult education, and entertainment. Other general quality of life questions may ask about residents’ feelings of safety in the community or their opinions about racial harmony. These kinds of questions can help create a baseline of information to be monitored as land use decisions are made over the years. Furthermore, if done correctly, the survey can provide results for different parts of the community so that better facility and policy targeting can occur. Many communities can benefit from understanding how residents feel about the kind and amount of growth they desire, and what type of growth management tools (if any) they would support. Questions about the rate of residential, retail, and job growth can help distinguish residents’ perceptions about these different kinds of growth. Furthermore, residents may be more concerned about some negative impacts of growth than others. Surveys can pinpoint this, and tell policymakers, for example, the degree to which residents are concerned about air pollution, traffic congestion, increased housing costs, decreased community diversity, degradation of streams, increased noise, or the “look” of sprawl. Many communities are authoring transportation master plans or creating plans to enhance the use of travel modes other than the single-occupancy vehicle. As part of this planning effort, staff and boards need to understand the current mix of travel choices and the kinds of incentives and disincentives likely to motivate residents to choose different modes of travel. Transit planning surveys often require that household members be recruited to maintain diaries of their travel behavior and complete a survey about the key circumstances that motivated their selection of travel mode. Sometimes on-the-spot surveys (called intercepts) are conducted among downtown pedestrians, motorists, or bus riders to determine why they decided to walk, drive, or take the bus. Park and recreation planning often requires assessment of current facilities and programs, as well as determination of the desirability of various park and recreation enhancements. Sometimes residents are asked if they would be willing to pay for specified services (through taxes or fees) and what amounts they would consider reasonable. Often residents are asked how frequently they have visited or used various recreational amenities. A citizen survey can address one of the central concerns in economic development -- the extent to which residents shop or commute to jobs outside the city. By determining where residents shop for various consumer items, it is possible to craft a strategy to attract potential retailers in categories where retail sales tax “leakage” is especially pronounced. By asking residents where they work, it is possible to track the changing strength of a community’s employment base. 1. Identify why a survey is needed and what it is intended to do. 3. Put a team in place to analyze the results when they come back. 4. Identify the target population and sample. 5. Determine how many people should be surveyed, and how to reach them. 6. Ask the right questions in the right way. 7. Ask the right person. 8. Test the survey and adjust if necessary. 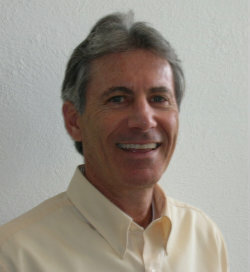 Thomas I. Miller, Ph.D., is founder and President of National Research Center, Inc., a survey research firm located in Boulder, Colorado. An expert in research and evaluation methods, Miller is the co-author of Citizen Surveys: A comprehensive guide to making them matter, published by the International City/County Management Association in 2009. His firm, which specializes in surveys that permit communities to compare their results with “peer” communities, maintains an integrated database of over 500 surveys completed by about a one half million residents in 44 states. Miller would be pleased to respond to readers’ questions about the article through our PlannersWeb Linkedin group page; he can also be reached at: 303-444-7863. 2. Determine how much your community is willing (able) to spend on the survey.